The INNOMAG U-MAG fluoropolymer-lined, magnetic drive pump has been specifically designed to provide outstanding performance and low total cost of ownership in smaller volume pumping applications in a wide variety of industries. 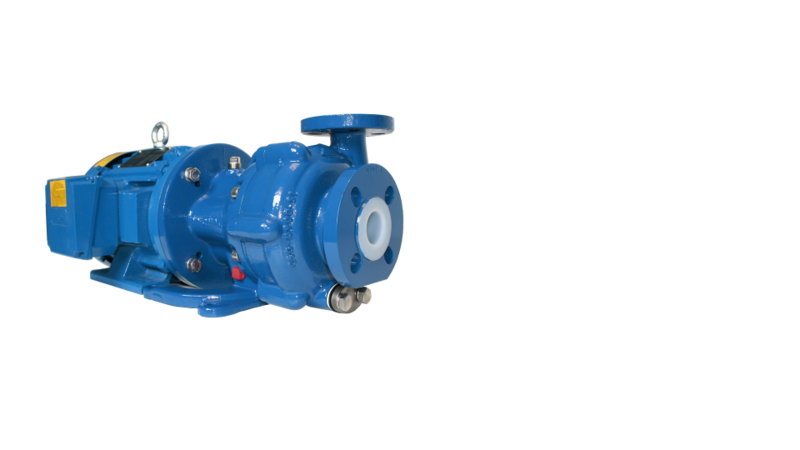 This versatile, compact pump offers outstanding leakage protection for compliance with environmental regulations or “clean floor” initiatives. An available high-purity configuration makes it ideal for applications demanding the strictest purity requirements. Dependable and easy to maintain, the U-MAG will deliver years of reliable, cost-effective service. ETFE or optional ultra-high purity PFA construction offers excellent chemical resistance. Universal flange design conveniently integrates with existing ISO, ASME and JIS piping connections. Numerous mounting and drive options accommodate site-specific requirements. Options include petrol engines for portable and remote chemical transfer, trunk unloading, skid or cart operation. The U-MAG is CE marked and compliant with applicable directives such as ATEX. The INNOMAG U-MAG fluoropolymer-lined, magnetic drive pump provides exceptional safety, performance and value in general purpose chemical process and ultra-high purity applications. Pure ETFE or PFA Casing Liner is rotationally moulded and vacuum rated. The liner has a minimum thickness of 3 mm (0.125 in). Universal Flanges accommodate ASME (ANSI), ISO and JIS piping connections. Other flange designs available. One-piece Impeller and Inner Magnet Assembly ensures maximum torque transmission, simplifies maintenance and eliminates balancing. Enclosed impeller with unobstructed eye delivers high efficiency and low NPSHR. Injection molded from carbon fibre reinforced ETFE or ultra-high purity PFA. Double-sealed Inner Magnets offer unmatched resistance to corrosive permeation by sheathing the magnets in 316L stainless steel before they are injection moulded into the impeller assembly. Powerful Neodymium Iron Boron (NdFeB) Magnets maximize torque transmission. One-piece Composite Containment Shell consists of aramid and carbon fiber reinforced ETFE (or PFA) for optimal leak protection, strength and corrosion resistance. Composite construction has zero eddy current losses for maximum efficiency. Particulate Control Ring prevents solids from damaging the containment shell and radial bearings. Sintered Silicon Carbide Pump Shaft is oversized to handle all radial loads. Stationary cantilevered design eliminates suction-blocking shaft supports to maximize flow and minimize NPSHR. Radial Bearing is process lubricated and highly reliable. Graphite or silicon carbide are available. Parts Interchangeability among the available sizes reduces inventory costs and eases maintenance. Motor Adapter With Universal Foot mates directly to a wide range of standard NEMA and IEC C-Face motors. No alignment is required.